Essential oils are wonderful – they can reduce stress, pain, headache, insomnia, fatigue, and cold and flu symptoms. But you may wonder: How do I use Essential Oils? What methods are best? How many drops are used? Here are some answers to these important questions. For an adult, add 15 drops of essential oil per ounce of carrier oil. For infants or children, use 3-6 drops per ounce. * Note: few essential oils can be used on children under the age of 4. Massage is perfect for relaxing, easing muscle pain, and improving circulation. I also think regular massage keeps me sane. Add 2-12 drops of essential oil into a teaspoon of honey, whole milk or vegetable oil (diluting helps prevent skin irritation). * Fill the tub with warm water, add your diluted oil to the tub and stir. 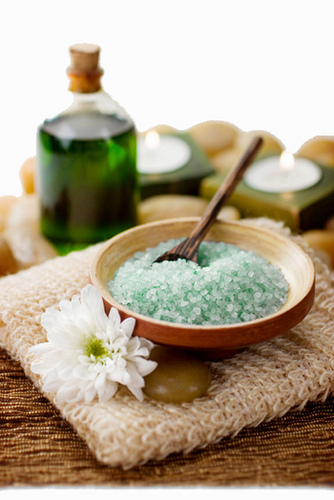 Aromatherapy bath salts can be added instead of oil. See our previous blog post on Bathing. Taking a bath will help relax or energize, depending on the oils used and the temperature of the water. Place 1 drop of essential oil onto a tissue and inhale. This technique helps relieve emotional distress and respiratory ailments. I use it on planes with lavender to relax or an immune blend to fight germs. Place a drop or two of oil on a cotton ball and put in a baggie. Sniff as needed. Pour 2 quarts boiled water into a heatproof bowl. Add 3-7 drops essential oil. * Cover your head and the bowl with a large towel. Keep your eyes closed and inhale for 10 minutes, or as long as you can without getting burned. It has been said that this method cannot be use for asthmatics. I have asthma and do steam inhalations, but only for short intervals. A steam inhalation is used to relieve sinus congestion, colds or coughs. Add 10-15 drops of essential oil per ounce of water in a bottle with a spray top. Shake before using. * A sprayer freshens the air to remove unwanted smells or add nice scents (spray a holiday blend just as guests arrive at your front door). There are different types of diffusers; candle, battery or plug-in. Use per manufacturer’s instructions. Depending on the model, diffusers can be used to reduce germs or set the mood. You now know some methods for using Essential Oils. How will you use them?